Anna Bolton | Greene County News Store owner Rich Demko pauses in the entryway of Red Barn Salvage in Spring Valley. Stephanie Demko watches as her husband Rich Demko pulls out a metal drawer from the hardware store counter they once bought at an auction. Christian, Stephanie and Rich Demko opened Red Barn Salvage at 5 West Main Street, Spring Valley, in October 2017. Spring hours for Red Barn Salvage are 9 a.m. to 5 p.m. Saturdays. The historic Spring Valley building now houses vintage and up-cycled items for sale. 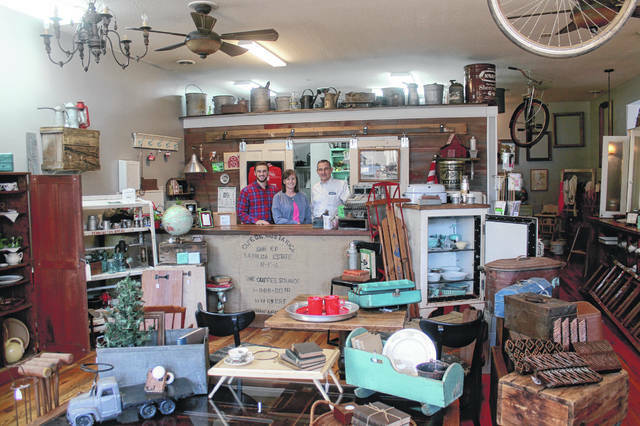 SPRING VALLEY — A Bellbrook couple always knew they’d open a store one day to house the old items they’d been salvaging over the years. When Stephanie and Rich Demko found a building on West Main Street in Spring Valley for sale, they hauled the old doors, window frames and vintage decor out of their barn and opened Red Barn Salvage in October of 2017. Over the 20-plus year they’d been collecting, the couple saved one piece in particular they’d picked up at an auction for their one-day store. So when that 21-foot-long hardware store counter fit, they knew they’d made the right decision. “That’s the perfect spot for it,” Rich Demko said, pointing out the piece along the wall, filled with removable galvanized metal bins. “It was like it was meant to be,” Stephanie Demko said. What was once a dry goods store in 1853, later became an antique store that Stephanie Demko remembers visiting with her mom. 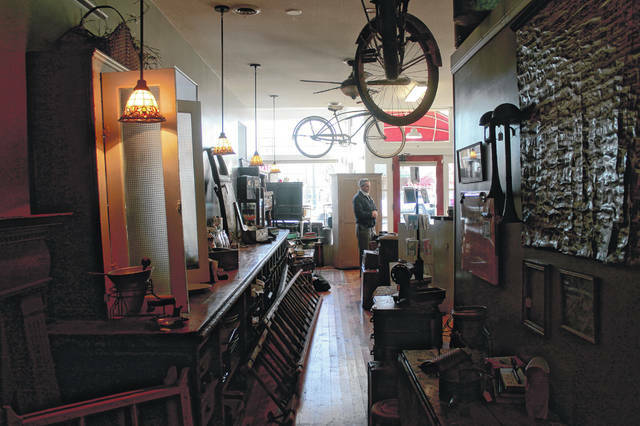 Years later, the store has a different feel to it now than fine antiques, instead showcasing primitive items, some creatively re-purposed by the couple and their son Christian Demko. The store is filled top to bottom: Old bicycles hang from the ceiling; wooden ladders and window shutters decorate the walls. Painted cabinets and shelves and even a vintage fridge store tea sets and leather luggage and hardcover books. 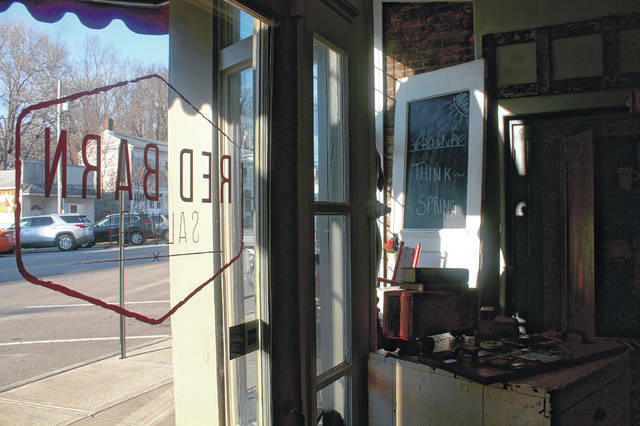 There’s Stephanie’s favorite chalk board door, two early National Cash Register Co. cabinets, and an old factory cart Rich topped with a paneled door. You won’t find anything new in the hobbyists’ store, except for a few sturdy wall hooks. And certainly no two items there are the same. “The more eclectic, the better that we like it. The last thing we want is run of the mill, this is what it’s supposed to be used for. We like taking pieces of parts from different items and marrying them together,” he continued. For now, the shop is open one day a week. “I look forward coming to the shop every weekend,” his wife said, adding that she loves seeing new customers and “regulars” from the community. Centering on community, the store sells other locally-made items — like greeting cards, goat milk soaps and Smales’ pretzels. Customers can also rent items for weddings and events, including barn doors, galvanized tubs, wood crates and more. 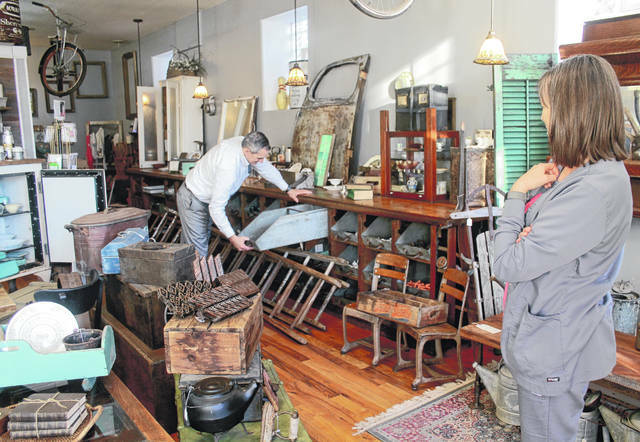 Red Barn Salvage, 5 West Main Street, is open on Saturdays, 9 a.m. to 2 p.m. during the winter and 9 a.m. to 5 p.m. starting in April. Appointments can be made by calling 937-626-9297.
https://www.xeniagazette.com/wp-content/uploads/sites/32/2019/03/web1_RedBarnSalvage.jpgAnna Bolton | Greene County News Store owner Rich Demko pauses in the entryway of Red Barn Salvage in Spring Valley. https://www.xeniagazette.com/wp-content/uploads/sites/32/2019/03/web1_HardwareCounter.jpgStephanie Demko watches as her husband Rich Demko pulls out a metal drawer from the hardware store counter they once bought at an auction. https://www.xeniagazette.com/wp-content/uploads/sites/32/2019/03/web1_Family.jpgChristian, Stephanie and Rich Demko opened Red Barn Salvage at 5 West Main Street, Spring Valley, in October 2017.
https://www.xeniagazette.com/wp-content/uploads/sites/32/2019/03/web1_ThinkSpring.jpgSpring hours for Red Barn Salvage are 9 a.m. to 5 p.m. Saturdays. 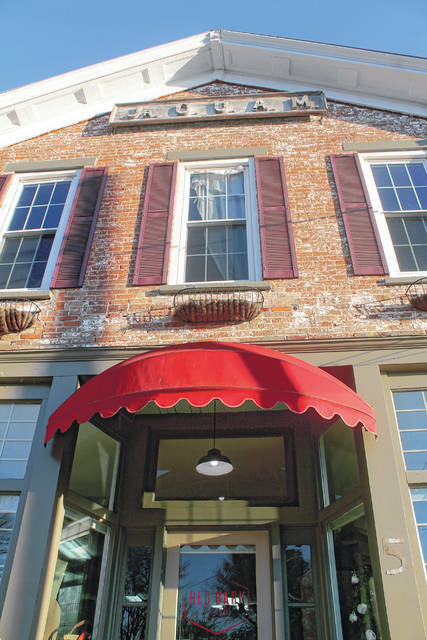 https://www.xeniagazette.com/wp-content/uploads/sites/32/2019/03/web1_Building.jpgThe historic Spring Valley building now houses vintage and up-cycled items for sale.